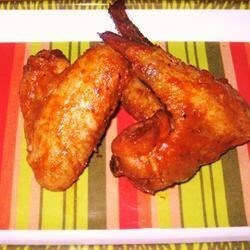 "I find this recipe to be delicious -- spicy chicken wings with a blue cheese dressing!" In a large frying pan or deep fryer, heat oil to 375 degrees F (190 degrees C). Fry wings for approximately 8 minutes. Transfer wings to a paper towel and let drain. Season with salt and white pepper. After the wings have drained, place them in a large mixing bowl. In a small saucepan, melt butter or margarine. Stir in hot pepper sauce. Pour mixture over chicken wings, toss to coat the wings. Place wings in a baking dish. While the chicken wings are baking, make the blue cheese dressing: In a medium size mixing bowl, combine mayonnaise, onion, garlic, parsley, sour cream, lemon juice, vinegar and blue cheese. Blend the mixture well. Arrange the baked chicken wings on a serving platter. Serve with blue cheese dressing. Very good, liked it at all. They are not really spicy though, so it might not be for everyone.